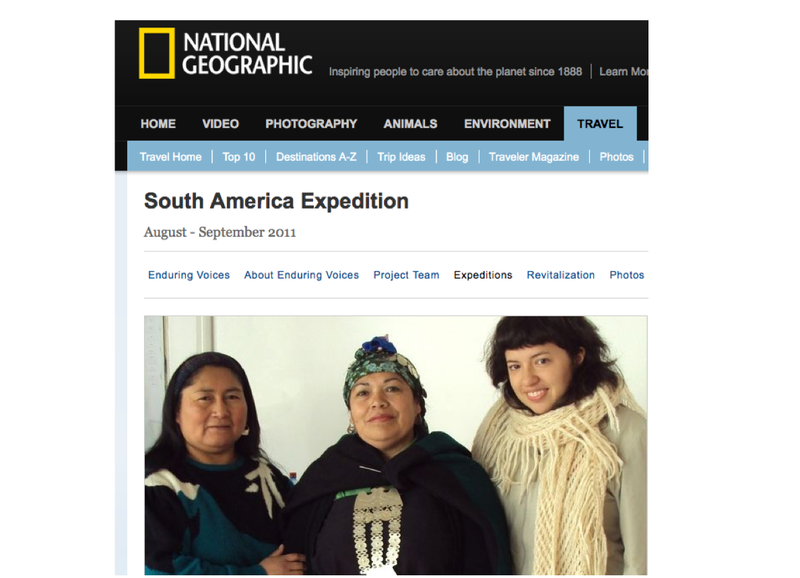 We are pleased to announce we are teaming up with National Geographic to produce a digital media skills workshop for speakers of Latin American endangered languages. The event is called “Voces Duraderas” (part of our “Enduring Voices Project“) and it will take place from January 7th to 11th, in Santiago, Chile. Twelve indigenous participants from seven different countries will be taking part in the workshop. We are really looking forward to this! The program (in Spanish) is available here. And, we are happy that our upcoming Latin American workshop has already received some great press coverage! Read about it in TIME Magazine’s Newsfeed, This is Chile (Chile’s official website), and on the Rising Voices blog. Photo caption from “This is Chile” article about the workshop. 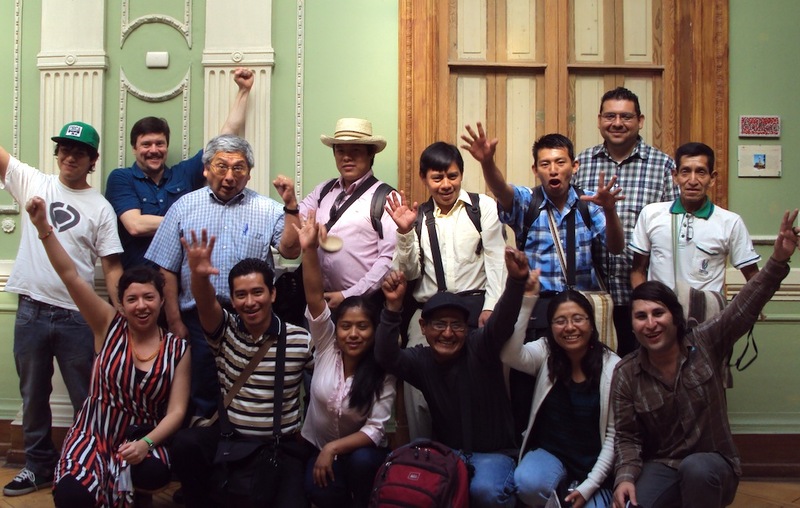 Thanks for reading and supporting endangered language documentation! This presentation was given at the United Nations Symposium on Language on May 1st, 2012. After giving a brief introduction to Language Hotspots (a model conceived and developed by Dr. Gregory DS Anderson and Dr. K. David Harrison), Anna Luisa Daigneault speaks about several indigenous language activists in Paraguay, Chile and Peru who are using digital technology in new ways to revitalize their endangered languages. Below the video is a text summary of what was discussed in her presentation. Every two weeks, the last speaker of a language dies. What would you do if you were among the last speakers of your language? Over 2500 languages and dialects are at risk of disappearing over the next 100 years. This sharp drop in linguistic diversity on Earth is linked to globalization. Fewer indigenous languages are now being spoken because of the influence of dominant languages, which are perceived to be socially and economically more valuable than minority languages. Many indigenous languages in the world have still never been documented. We are living through an unprecedented global shift towards dominant languages. As scholars, language activists, and policy-makers, there is a lot we can do protect languages that are threatened, by empowering grassroots languages activists to create new materials in their languages, and using new technology to conserve dying languages, thus providing a flipside to globalization. Digital media tools now provide a new pathway for transmitting and conserving oral cultures that are threatened by extinction. At the Living Tongues Institute for Endangered Languages, we have identified areas of the world that we call Language Hotspots. They are geographic clusters where a high number of indigenous languages are currently nearing extinction. Language Hotspots are scientifically determined according to 3 factors: high levels of linguistic diversity, high levels of endangerment and low levels of documentation. These are the areas where documentation is urgently needed, and where we are focusing our attention. Along with academic research, we are also dedicated to supporting language activists in these specific regions. 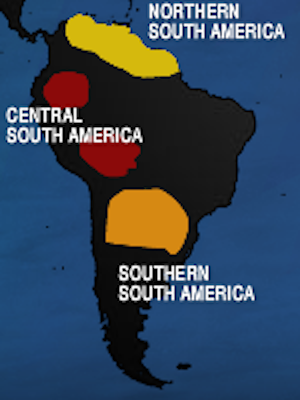 On the map for the South American hotspots, we see several regions where numerous languages are critically endangered: Venezuela and Guyana to the north, Ecuador and Colombia on the Pacific side, Peru and Bolivia in the center, and Paraguay, Argentina and Chile in the south. In this presentation, I will share with you some success stories from some of these places, where language activists are, despite the odds, breathing new life into their speech communities by creating new materials in their languages. These people I will introduce you to are language warriors, and we can also call them language champions. The creation of language tools such as bilingual texts, dictionaries, descriptive grammars and audio-visual materials are crucial because they provide a solid and systematic basis for conservation efforts to take place. Empowering and training native speakers to steer in the documentation process is the most sustainable way to conserve a language. Andres Ozuna is a natural linguist. He is a young Ishir (Chamacoco) man from a remote region of northern Paraguay, the Chaco forest. There are fewer than 1000 speakers of Chamacoco left. 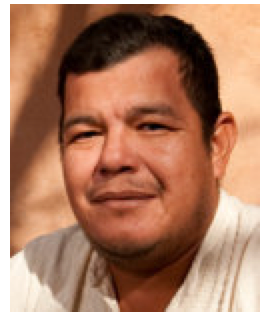 Andres has a natural ability to analyze languages and document traditional knowledge. When I met him several years ago, he had stacks and stacks of handwritten papers in his house. He had been busy writing down everything in his language for years: interviewing the elders in his community, recording all of the local plants and their medicinal uses, creating a dictionary on new as well as archaic terms. He had everything written down but had no way to get the information onto computer. So we equipped him with a laptop and camera, and trained him how to use the appropriate software, and he set about typing up everything he had. Within six months, he had typed up his first book and approached scholars at a university in Asuncion, Paraguay, and they helped him edit and publish it. It is entitled “The Wisdom of the Ishir People of the Chaco” [La sabiduria de los Ishir del Chaco]. 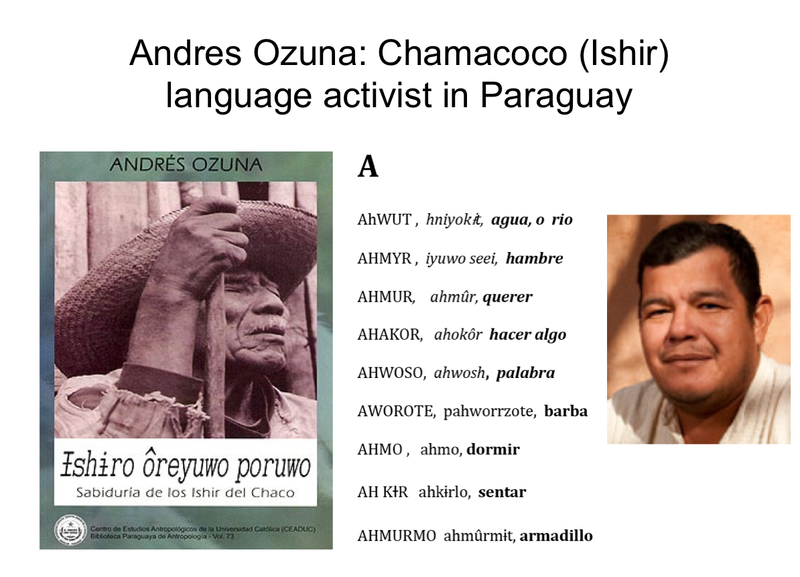 Now we are working with Andres and many other members of his community to produce the first ever Chamacoco Talking Dictionary. It is an online encyclopedia where one can listen to audio recordings of terms and phrases in Ishir (Chamacoco). It currently contains 900 entries of Ishir words and we will be adding another 800 words by the year’s end. This will be a great learning tool for Chamacoco schools and also for Paraguayans who wish to learn about their language and culture. 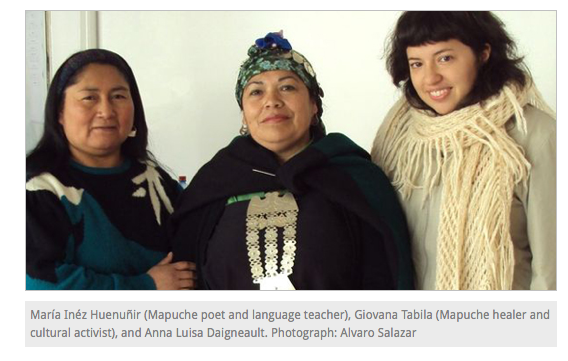 Over in Chile, speakers of the Mapuche languages, Mapudungun, Tsesungun and Huillichesungun, are initiating and promoting language courses and bilingual poetry events through extensive use of social media. Facebook, Twitter and Youtube have been very useful tools for the Mapuche people. Maria Antihuala Huenuñir is a poet who writes poems in Mapudungun and Spanish. One of her main themes that she explores is being a Mapuche woman living in an urban environment. She has also produced many songs and stories for children. Our work in Chile was supported by “The Enduring Voices Project” which is a collaborative initiative between the Living Tongues Institute and the National Geographic Society. When I went to work with Maria, I trained her how to use a video camera so she can create video poems in Mapudungun. Her picture, along with her colleague Giovana Tabila, a Mapuche traditional healer, appeared on the National Geographic Society website, which was amazing for her. External, international validation was really encouraging for her community and her work. The internet is key for this kind of international recognition to occur, and to be shared with other. In other parts of South America, the internet is just starting to become available to people in remote regions. In the Amazon, for example, many communities do not have electricity or phone lines, but community members frequently travel to nearby towns to use the internet, send emails, correspond with their networks. The Amazon is a part of the world that is facing all kinds of severe threats due to deforestation, pollution and loss of biodiversity. The people are also experiencing rapid social and economic transformations that are leading to the loss of traditional lifestyles. Indigenous languages are also under threat in the Amazon and their loss parallels the loss of the natural world. Some Amazonian people are determined to keep their ancestors’ memories alive. Community members are collaborating with researchers to produce new materials that will allow them to hear their ancestors’ voices. With the support of the Instituto del Bien Comun (Institute for the Commons, in Lima, Peru), the Yanesha Memory Digital Archiving Project in the Peruvian Amazon has built an online audio archive containing over 300 hours of oral texts and music, recorded between 1968 and 2000 by anthropologist Richard Chase Smith and Espiritu Bautista, Yanesha cultural expert. Espiritu and and his son Eder Bautista are language warriors determined to keep their language alive. They have been learning how to use computers to record, edit and store information in the Yanesha archives. I have been working with them for several years, under the guidance of anthropologist Richard Chase Smith, and it has been amazing to witness their project unfolding, and the information becoming accessible to community members. We are planning several workshops for youth to learn how to navigate the archives. 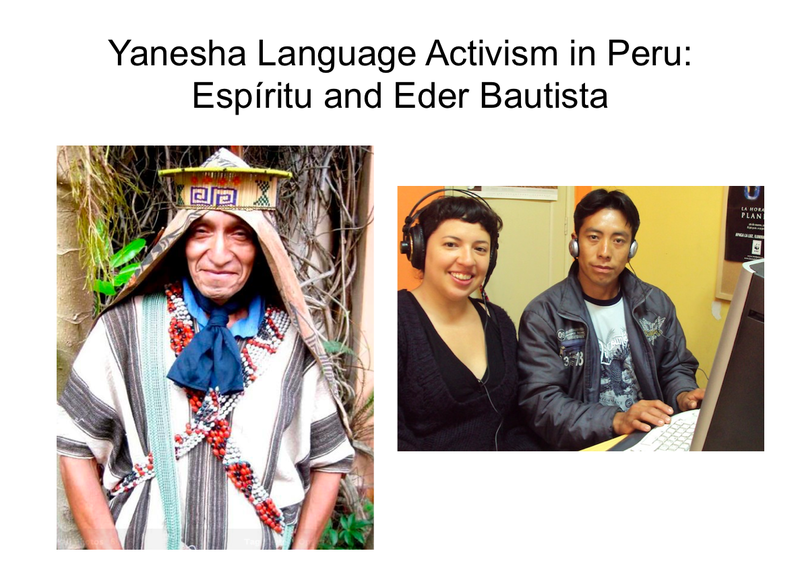 Yanesha cultural and linguistic activists from the Amazon have been involved in promoting their culture and have achieved a recent success in Lima, the capital of Peru. An exhibit of Yanesha artwork, music and oral history was recently inaugurated at the Museo de la Nacion, one of Peru’s most prestigious museums. This kind of recognition can really help transform the public’s view by inspiring them to appreciate indigenous cultures and languages, and not discriminate against them. All of these initiatives represent important milestones for indigenous language conservation in South America. We should support language activists around the world because they are on the forefront of language shift, and are struggling to preserve the knowledge of their ancestors. Digital tools provide a new avenue to conserve the ancient wisdom encoded in indigenous languages. Digital technology is a powerful means to conserving knowledge for future generations. 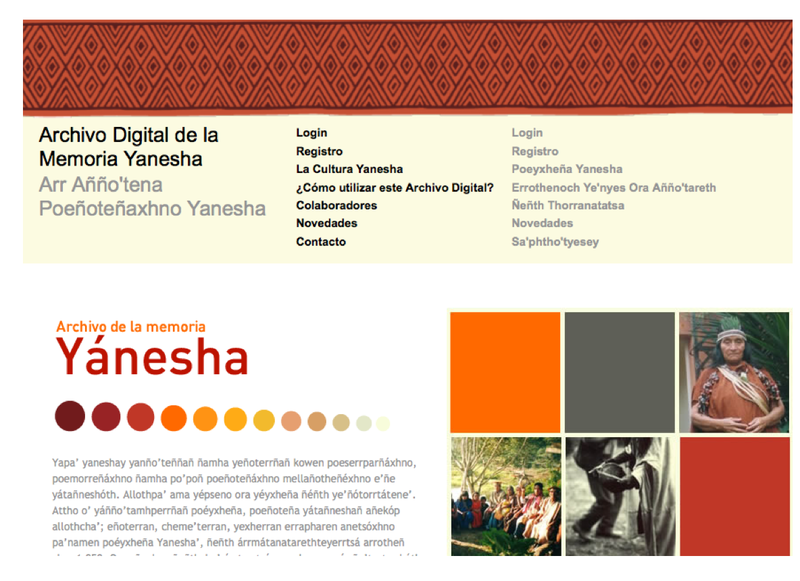 The Yanesha Memory Archives is a project organized by the Federation of Yanesha Communities in collaboration with El Instituto del Bien Común in Peru. It is coordinated by anthropologist Richard Chase Smith in collaboration with Yanesha cultural expert Espíritu Bautista. Daigneault (Living Tongues) has been working on the project since 2008. 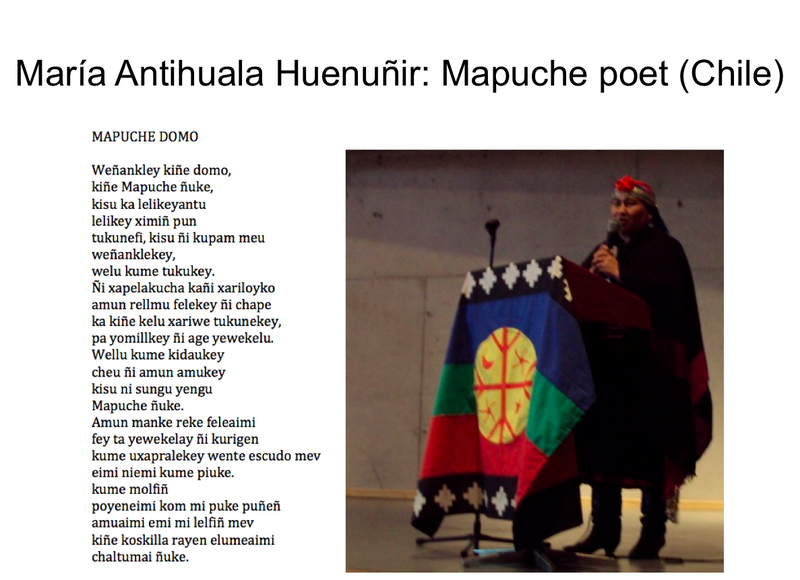 For more on Mapuche language activism in Chile, search for “Mapudungun” on Facebook and Youtube. For more on Maria Inés Huenuñir Antihuala, Google her name to see videos of her, and read her poetry online. Her book of bilingual Mapudungun-Spanish poetry is entitled “Más Alla de Ser Mapuche” (Beyond Being Mapuche).